Going to the mall to get your photo taken with Santa is lame. 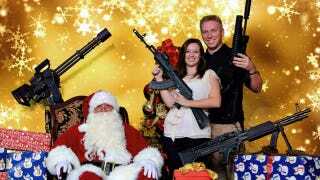 Instead of waiting for hours surrounded by screaming children, head down to your local gun club and get your picture taken with Santa and machine guns. Yeah, let's see the Grinch try to steal Christmas this year.